Like most other browsers, Google Chrome has some special pages that show information about memory usage, cached files, plug-ins and more. Here's a list of the most interesting about: pages available in Google Chrome (you can open them by dragging about:name to the address bar). 2. about:plugins - the list of plug-ins that are available in Google Chrome: Shockwave Flash, RealPlayer etc. 3. about:cache - a list of all the web pages cached by Google Chrome. The browser doesn't have an option to limit the cache's size, so it's recommended to regularly empty the cache. 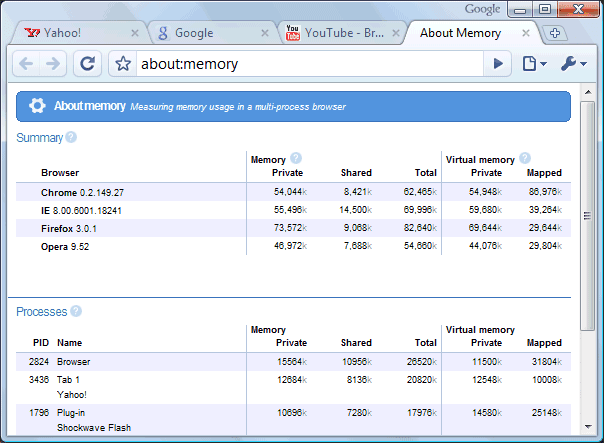 4. about:memory - this pages compares the memory used by all the active browsers and by Google Chrome's tabs. 5. about:stats - a list of internal counters and timers that has a funny subtitle "Shhh! This page is secret!". 6. about:histograms - a list of histograms for Google Chrome's internal metrics. 7. about:dns - Google Chrome prefetches the DNS records for 10 frequently visited hostnames. This feature can be disabled in Options > Under the Hood by unchecking "Use DNS pre-fetching to improve page load performance". 8. about:network - this page could be used for I/O tracking and it's a partial replacement for the Live HTTP Headers extension. Click on "Start I/O tracking", open a web page in a new tab and you'll get a list of all the images, scripts and objects loaded from that web page. 9. about:crash - crash the active tab. Google Chrome displays the "sad tab" image, followed by this message: "Something went wrong while displaying this webpage. To continue, press Reload or go to another page". 10. about:hang - type this in the address bar of a tab when there's already an active web page to hang the process (this means that the process no longer accepts any signal, but it's still running). The other tabs will continue to work and the active tab can be closed. 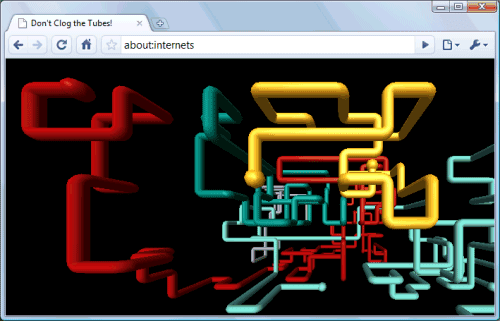 11. about:internets - this is an Easter egg that references two popular Internet memes: Internets and Series of tubes. Google Chrome embeds the 3D Pipes screensaver from Windows, so you'll see it only if you have the file sspipes.scr in C:\Windows\System32. I pressed Ctrl+U (view source) while viewing the "about:crash" page, and Google Chrome crashed (the standard Windows error "don't send the report to Microsoft") after having asked me whether I wanted to reload the page because of a problem. I got the same error message when I tried to type :% in the address bar and when I pressed Ctrl+U on the crash page: Google Chrome is blocked. Restart now? (maybe not exactly this since mine is in French). I found a way to reproduce my bug with the source of the crash page. You have to avoid opening a new tab and then typing "about:crash". To crash Google Chrome just follow your tip: drag about:crash not in the address bar but on the "new tab" (+) button after the last opened tab. And then just try Ctrl+U, it should crash. Thanks - good stuff! Great browser. Love it! That no longer causes a crash. I'm glad it's fixed. Don't really know how long its been fixed, but it's been 4 years since your post. If this was IE, four years later IE would still be the same version and still have the same error. So, good job Google, now stop showing crappy advertisements on my Phone! Why does Chrome use the IE settings for connection ? I have FF as my default browser and had switched off proxy in IE and FF but not in chrome. I switched on the proxy in my FF but not in IE. ( and did not change chrome settings at all) When i started chrome, it was not connecting. Found out the settings for connection and lo the IE connection settings pop out of chrome. So why is chrome riding on top of IE setting ? Damned, my version is already outdated ? Thanks for complete list of abouts. It's shame that about:config don't work in chrome. I installed the latest snapshot of Chromium, the open source project behind Google Chrome. There's no Google branding. And thanks for your blog ! hey, how do you got this skin ? 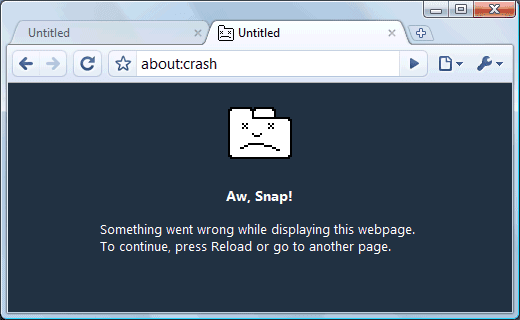 I didn't like "about:crash" page, I'd expect something more funny and creative from google. Heu.. Google has forgotten the RSS or I am stupid??? Did you forget that this is Google Chrome 0.2, not Firefox 3 or IE 8. For this initial release, Google wanted to create a solid foundation for the future. Features like previewing feeds, organizing bookmarks, customizing the interface will come later. Totally agree the last Alex comment. As a browser framework, I found Chrome as a really good start ! I hate all your Chrome stuff. If Google was serious, they'd release Mac and Linux and Windows versions all at the same time. Nice post and if you want to have a more detailed overview and more Easter eggs of Google Chrome , check out this post. I am not able to use chrome.....getting error...."Something went wrong while displaying this webpage. To continue, press Reload or go to another page". ActiveX ??? Whatttt??? How I can disable IT!!! i have the same error ! how bad !!!! The User-Agent clearly varies. I get : "Mozilla/5.0 (Windows; U; Windows NT 6.0; en-US) AppleWebKit/525.13 (KHTML, like Gecko) Chrome/0.2.149.27 Safari/525.13"
when i try to search a word on google search engine from "Google chrome" then it goes to crash for every time..
You can provide an own proxy server for Google Chrome using the command line argument "--proxy-server=PROXYSERVER:PORT"
So Chrome will not more depend on IE proxy settings. As far as I can tell, the ':%' bug was fixed and released within about a day of it being identified. The "--proxy-server=PROXYSERVER:PORT" command line switch does not seem to work since Chrome v149.27. I've tested using 149.29 and 149.30 running in Vista and under wine in linux. I would like to know "how to manually empty the cache" ? Thanks a lot! Assuming the proxy requires authentication (as in my workplace), is there a way to provide this with command line arguments, I'm not worried about the password not being displayed in the encrypted form "--proxy-server=PROXYSERVER:PORT", how would I provide a username/password@proxyserver command with this? Is it possible? thanks, issue is that each and every tab prompts for this, and is quite irritating. Chrome remembers the username and password but forces me to click the login button. How can I change Google Chrome's download list? I don't like how google chrome's download page ctrl+j is, I prefer firefox's, mainly... Use the clear browsing data option under tools. The Google Chrome that I use automatically updates itself. hey, i have version 2.0.172.31 and most of the about pages aren't working... like about:stats and stuff... is that normal, did they disable it in the new releases? Is there an easy way to cusomize Google Chrome's home page or bookmark bar location? I'd like to show more than 9 frequently viewed web pages, and I'd like to move the bookmarks bar to a column in the white space on the sides of most pages. Is there a custimization utility like in firefox? Looks like each of these about pages have been disabled in recent builds. I also have 2.0.172.31.
i am using google chrome.. and it is faster dan ie and firefox.. i have d'best experience in chrome..
Something went wrong while displaying this web page. To continue, press reload or go to another page. over and over and over and over and over and over. Read "Did you forget that this is Google Chrome 0.2, not Firefox 3 or IE 8." Does this mean the toaster won't make toast? What a load of crap. Oh well, guess I have to go back to firefox. as cumbersome as it sometimes is, it always works. Not so with chrome. I'm presuming my folks here at IT aren't too comfy with basic authentication? I have google chrome 3.0.195.38 and about:stats is not working! Anyone able to help? Does anyone know how to fix this irritating message all the time I am playing 'shockwave became unresponsive'??? When I delete or move my Bookmarks, would be more comfortable to have window open. Some of these pages are no longer available in never versions of Chrome. Now on 4.1 about:stats and about:internets don't show anything. I have the latest version as of 4/29/2010 ...Chrome seems like junk so far...flash in the pan. You're probably using security software that blocks Chrome (most likely, a firewall). Maybe the software you're using is not very good or it's not up-to-date, so you shouldn't necessarily blame Chrome. why doesn't the about:stats work on version 10.0.648.82? but i dont care about it..
@Thampan - Chrome does not use IE's internet settings, it uses the native OS internet settings, which happen to be the same ones that IE uses on Windows, thus you see the same box, but is Windows' settings, not IE's. At least in chromium (the project behind chrome) version 15.0.874.106 typing "chrome://chrome-urls" (without quotes) gives a full hyperlinked list of all the chrome:// urls available in the current version. Cool That is soooooo awesome! I could rewrite this entire article using the data from chrome://chrome-urls!